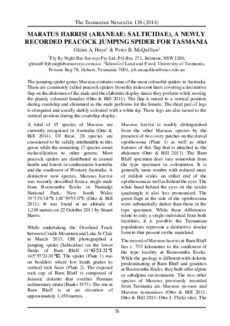 The jumping spider genus Maratus contains some of the most colourful spiders in Australia. These are commonly called peacock spiders from the iridescent hairs covering a decorative flap on the abdomen of the male and the elaborate display dance they perform while wooing the plainly coloured females (Otto & Hill 2011). The flap is raised to a vertical position during courtship and shimmied as the male performs for the female. The third pair of legs is elongated and usually darkly coloured with a white tip. These legs are also raised to the vertical position during the courtship display.